Tesla (NASDAQ:TSLA) has put together a decent run the past few months. Model 3 production has ramped up, with the company surpassing the 5K per week target and heading toward a 6K per week rate. In Q3, TSLA posted its first profit since 2016, leading to a Tesla stock rally. Now the company is turning its attention to infrastructure. CEO Elon Musk tweeted yesterday that Tesla Supercharger capacity will double by the end of 2019, and added that the long-awaited Supercharger V3 will begin rolling out next year as well. With its electric cars, Telsa faces an additional challenge that traditional automakers don’t have to worry about: re-fuelling infrastructure. The cost of a Tesla — even the “electric car for the masses” Model 3 — is already barrier, and will be more so as the company’s federal income tax credit for buyers begins to wind down in January. But additionally, batteries can only go so far before needing to be recharged. And that often means seeking out a Tesla Supercharger station. Elon Musk took to Twitter yesterday afternoon to announce that Tesla’s Supercharger network capacity would double by the end of next year. He also noted that the company would begin rolling out the new Supercharger V3 in 2019. Traditional auto makers have had a century for re-fuelling infrastructure to grow. The number of gas stations across the U.S. has actually been shrinking as fuel economy improves, but in 2015 it was estimated there were over 111,000 service stations selling gasoline nationwide. Most of these have multiple gas pumps, and to fill the average car from empty takes just a few minutes. Drivers of traditional gas-powered cars from Ford (NYSE:F) and other car makers don’t think twice about the range of their vehicle because they are always just minutes away from a gas station. Tesla owners can charge their cars at home overnight, but for any road trips they are looking for charging stations. 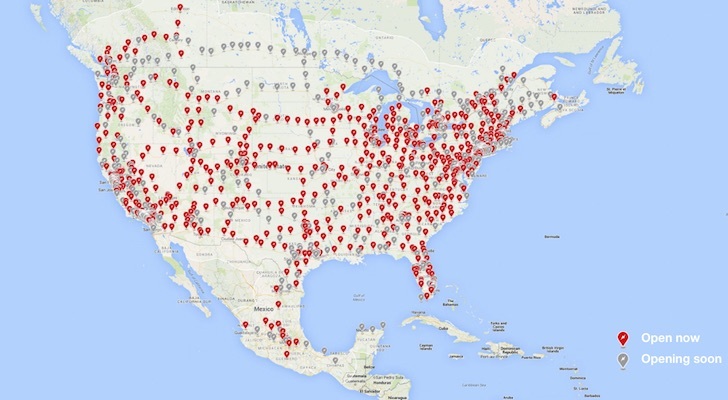 Public charge stations are slowing starting to appear, but its the Tesla Supercharger Stations that are first choice. No adapters are required to use the chargers, charging is usually faster, and with some Tesla vehicles free Supercharger credits are a part of the deal. The problem is there are currently only 11,414 Superchargers installed worldwide. Although most of those are in North America, the spotty coverage can still lead to range anxiety for Americans considering buying a Tesla. If Tesla is able to double the number of Superchargers available, that goes a long way toward making its electric cars an easier sell. The rollout of the Supercharger V3 would also be a big deal. It promises to recharge a Tesla in just minutes. This would eliminate one of the biggest complaints about electric cars and also free up chargers for other drivers much more quickly. If Musk can deliver on his claims for 2019 — doubling Tesla Supercharger network capacity and rolling out Supercharger V3 — that would be a good thing for TSLA shareholders and Tesla stock. Competition in the electric car market is becoming tougher than ever, and federal tax credits are disappearing. The Supercharger network will be increasingly important for boosting sales of Tesla cars and it’s an area where Tesla can leverage a big advantage over its competition. Article printed from InvestorPlace Media, https://investorplace.com/2018/11/tesla-plans-to-double-supercharger-network-size-in-2019/.